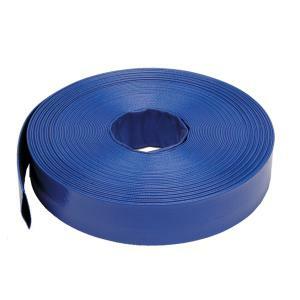 This medium pressure layflat hose is recommended for Drip Irrigation Systems. Constructed with 3-ply high tenacity polyester yarns. Both tube and cover extruded simultaneously to obtain maximum bonding. UV resistant for longer life. Anti-delamination, anti-expansion, anti-elongation, anti-torsion factors decrease stretching when pressurized. Drip Depot stocks the 2" size, all other sizes will dropship directly from supplier. Hose Size 2" 3" 4" 6" 8"
*Caution: Temperature Range: -4° F to 158° F. If temperature exceeds 111° F the working pressure will decrease.